This terrific deep-fried turkey recipe is kindly provided by Aricka Westbrooks, owner of Jive Turkey in Brooklyn, New York. Combine marmalade, wine, juice and garlic. Bring to a boil. Simmer over low heat for 20 to 30 minutes until reduced and slightly thickened. Divide the glaze: use 2 cups for marinade/injection. Strain 1 cup to inject the entire turkey (the rind and garlic will not pass through the needle). Inject 2/3 cup marinade deep into the breast muscles, 4 tablespoons into the leg and thigh muscles and 1 Tbsp. into the meaty wing section. Do not inject the marinade just under the skin as a water-based marinade will result in the hot oil popping and splattering. 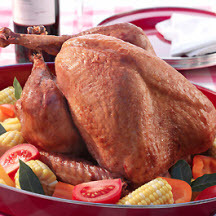 In a shallow dish, marinate the turkey in the refrigerator using 1 cup liquid, breast side down, for 8 hours. The remaining glaze may be used to serve with the turkey. Store in refrigerator until ready to serve. Remove turkey from marinade and discard the marinade. Truss and prepare turkey for frying. Remove the neck and giblets from the two body cavities. Remove any excess fat around the neck to allow the oil to flow through the turkey. Remove the wire or plastic truss that holds the legs in place (if applicable). Cut off the wing tips up to the first joint and cut off the tail. Remove the pop-up timer from the breast (if applicable). To reduce spattering, thoroughly dry the interior and exterior of the bird. Preheat oil to 365°F (185°C) to 375°F (190°C). Fry the turkey about 2 minutes per pound until golden brown and the internal temperature reaches 165°F (73.8°C) to 170°F (76.6°C). Lift the basket from the oil and transfer to a roasting pan. Drain the turkey completely and let stand for 20 minutes before carving. Warm remaining glaze and pour over carved turkey.